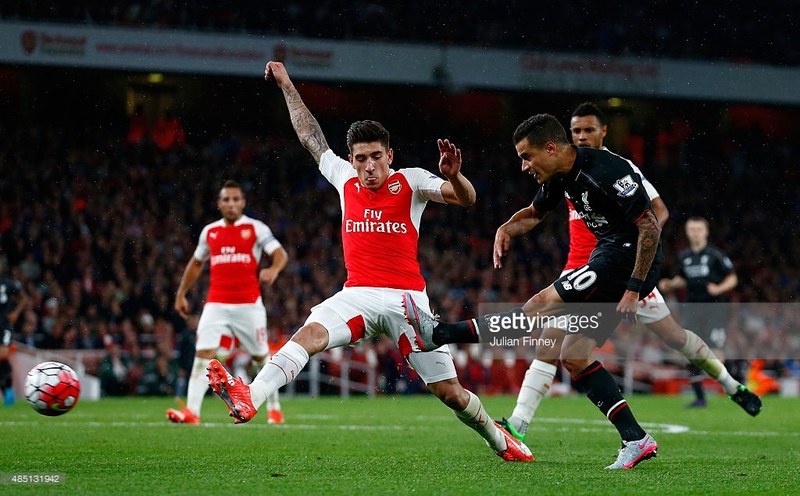 Liverpool and Arsenal played to entertaining draw at the Emirates Stadium. Arsene Wenger was forced into forming a make-shift centre-back partnership of Gabriel and Calum Chambers, as first choice defenders Per Mertesacker (illness) and Laurent Koscielny (back issue) unavailable. Wenger persisted with the same front six that started a week prior at Selhurst Park. Brendan Rodgers tinkered with the system that earned Liverpool two wins to start the season, moving to a compact 4-3-3. Roberto Firmino made his official Premier League debut from the right, while Emre Can and Lucas Leiva joined James Milner in midfield. The abundance of attacking players in the starting XI combined with shaky back-lines suggested that there would be goals at the Emirates, but this action-packed, open affair shockingly concluded with neither side converting their chances. The Reds were dominant in the opening half, but as they tired Arsenal gained territorial dominance but were vulnerable in transition – put simply, it was a game of two distinct halves. The most interesting story line heading into the match surrounded Rodgers XI. Liverpool kick-started their campaign with two unconvincing displays – albeit claiming maximum points – and with Jordan Henderson unavailable due to a foot injury, the opportunity to include a defensive-minded midfielder was a logical move. 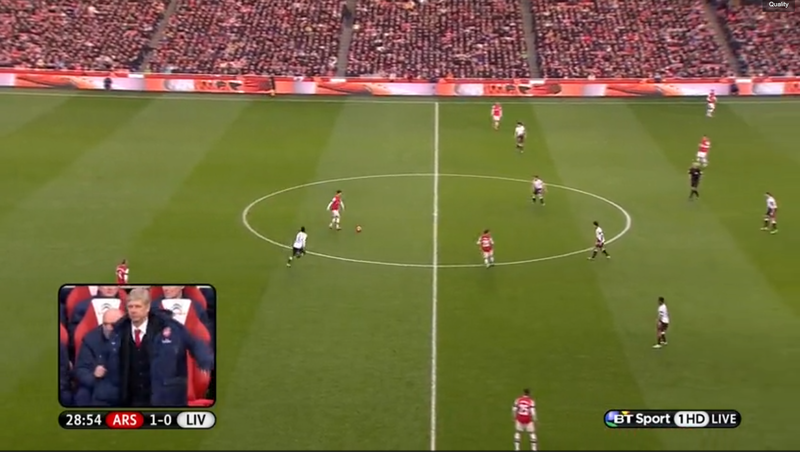 Here, Rodgers moved to a 4-3-3, moving Milner and Emre Can as shuttlers ahead of Lucas. This was significant due to the risk of being overrun in midfield with Henderson and Milner started ahead of the back four, as neither player is a legitimate ball winner. 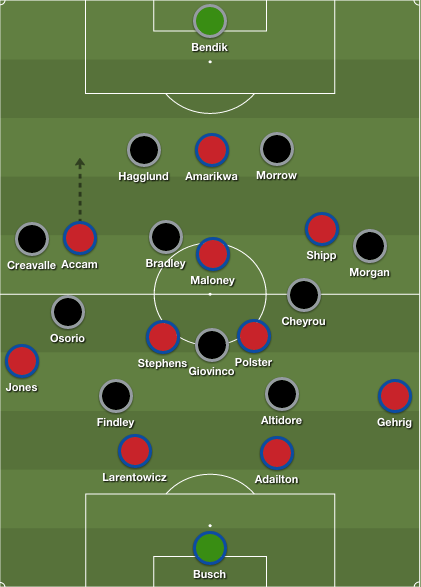 The 4-3-3’s defensive base shape is a 4-5-1, and Liverpool’s midfield band remained narrow and compact, improving the overall structure of the side. Rodgers was expected to alter his side’s approach against Arsenal’s fluid attack, and the move to a 4-3-3 suited the side, improving their natural balance and defensive solidity. Considering the several new additions to Rodgers’ squad combined with the Reds’ poor displays thus far, their energetic start came as a surprise. Surely, Rodgers most impressive win against Arsenal followed this template, but here, the lack of familiarity within the squad suggested that the home side would dictate the opening period. However, within the opening five minutes, Liverpool exploited Arsenal’s inexperienced make-shift back four and their fullback’s advanced positioning. Can was free to charge into left half-space before pulling back the ball for Benteke, but the Belgian slashed his shot wide. A similar move occurred a few minutes later, as Milner played in the Liverpool striker in right half-space, resulting in Coutinho firing the subsequent pullback off the cross-bar. It’s key to note that Arsenal scored a lovely goal that was wrongly disallowed, yet shortly afterwards Lucas dispossessed Alexis, and clever work from the two Brazilian’s placed Benteke into right half-space, but Petr Cech made a key save. 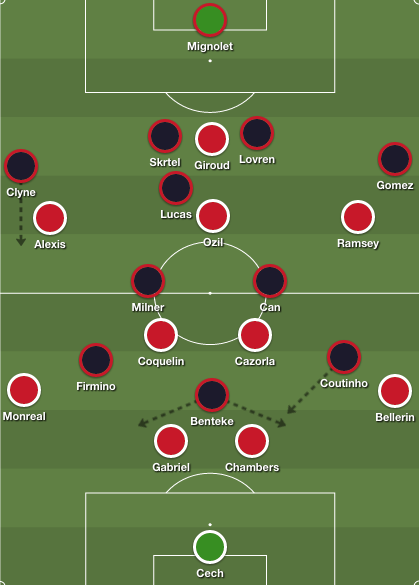 Oddly, Arsenal started poorly, with the Reds dominating half-spaces between both advanced full-backs, but once again, their profligacy in the final third proved costly. 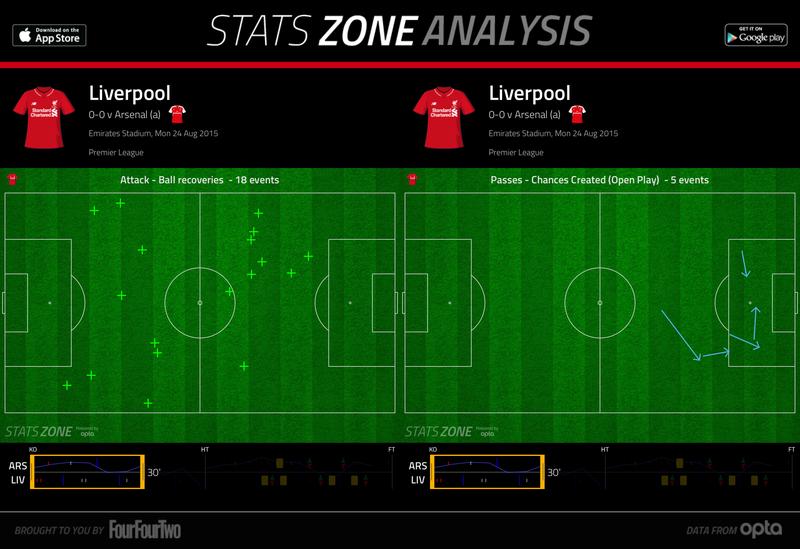 Equally, the additional component to Arsenal’s difficulty in the opening half, and Liverpool’s dominance, involved the former’s poor passing in their half and the final third. 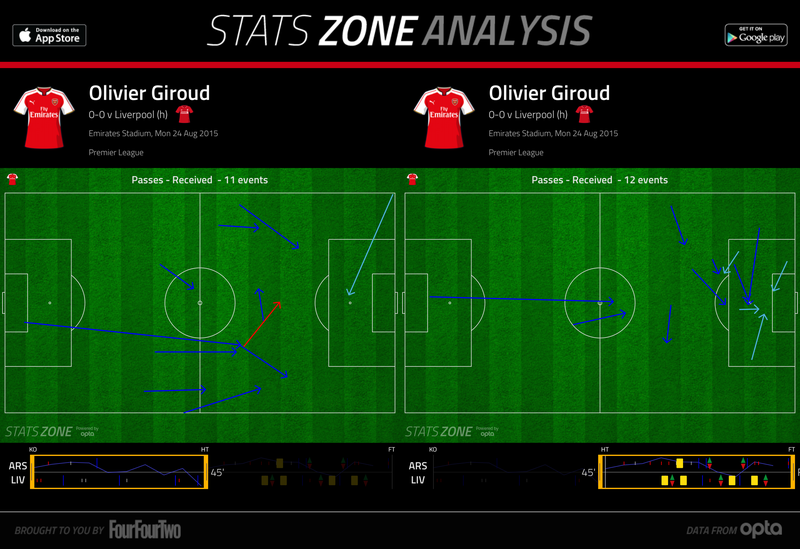 Much credit should be awarded to Lucas who negated Ozil’s threat between the lines and blocked off passes into Giroud. Wenger’s side found it difficult to break past Liverpool’s narrow 4-5-1 – Can and Milner closed down Arsenal’s midfield duo when they received possession, depriving the Gunners a genuine link between midfield and attack. 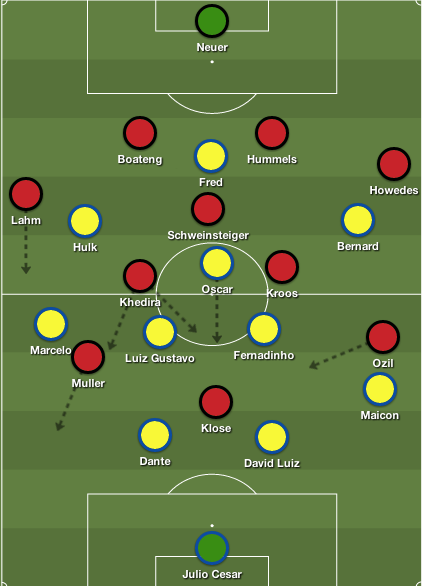 Essentially, teams bypass midfield pressure through service from the back-line, but the inexperienced Arsenal centre-backs proved inadequate options. Chambers, in particular, enjoyed a dreadful half, conceding possession three times to Coutinho alone. 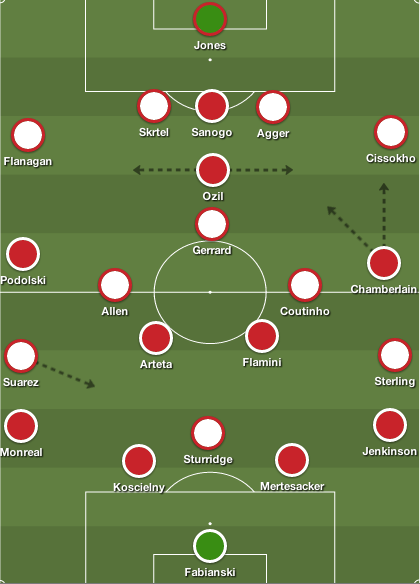 Liverpool’s midfield quintet was also influential via collective pressing, as they harried Arsenal’s duo when they attempted to play short passes through central areas. One incident in the opening half witnessed Lucas, Milner, Can, and Coutinho harry Coquelin and Cazorla, which forced the former to make a desperate last-ditch tackle to halt Benteke’s surge into the box. At times, Arsenal produce their best football when they play quick combination passes amongst each other, but Wenger’s men failed to gain a rhythm due to Liverpool’s pressing, Lucas’ positioning, and incompetent passing out of their half. As expected, Liverpool were unable to maintain their pressing over the course of 90 minutes, thus reverting back to a narrow 4-5-1 deep in their half. 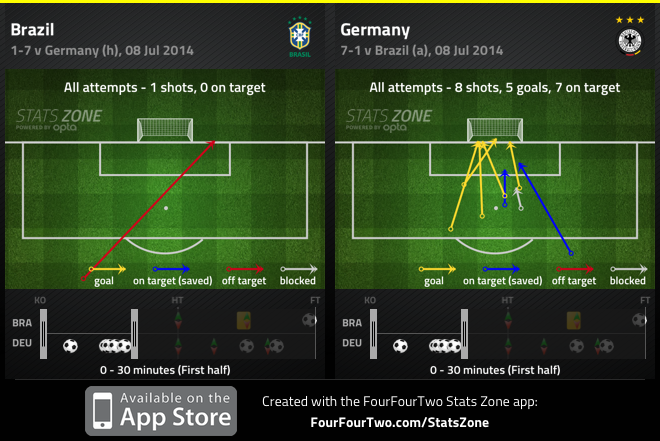 Therefore, the Gunners were free to monopolize possession in the box, and penetrate wide areas to create chances. Now was the ideal time for Bellerin and Monreal to surge forward, and the full-backs delivered positive crosses into the box. Movement from wide areas led to Alexis hitting the post, and a Bellerin cross resulted in Giroud squandering a glorious opportunity to nick a winner in the six-yard box. Giroud benefitted from the shift in dominance, as he was subdued in the first half due to lack of service in the final third – Lucas’ influence also played a factor. The Frenchman wouldn’t be deemed a prolific finisher, but his superb link-up play virtually makes him an additional playmaker – hence, why he improved once his teammates received space to play passes into him and charge forward. It’s unsurprising to see Giroud involved in Arsenal’s best moves during their 20-minute spell of dominance, and though he missed a key chance to put the Gunners ahead, it was odd to see the Frenchman replaced for Theo Walcott. 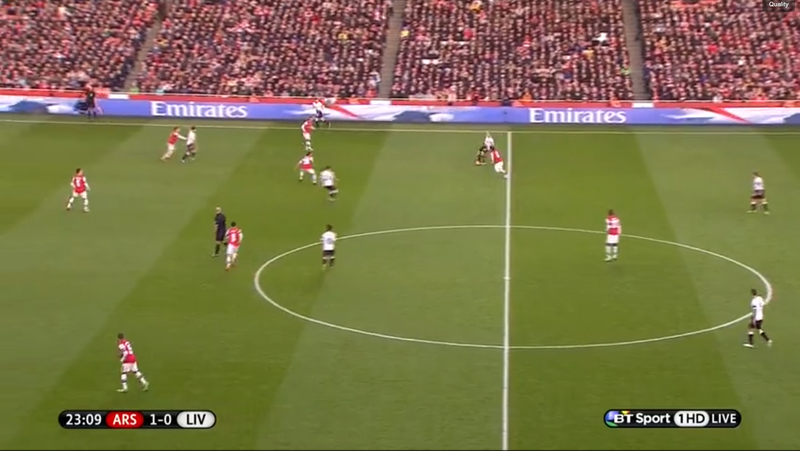 With the Gunners pushing men forward, there was ample space for Rodgers’ men to exploit on the counter. Liverpool broke quickly in the first half, but most moves involved the Reds pressing higher up the pitch to win possession. Contrastingly, Gomez, and substitute Alberto Moreno, won the ball in their own half before charging forward into Arsenal’s half on the counter. The former’s opportunity witnessed Milner fire a shot directly at Cech, while the latter’s poor decision-making saw him overrun the ball opposed to playing in the unmarked Can. 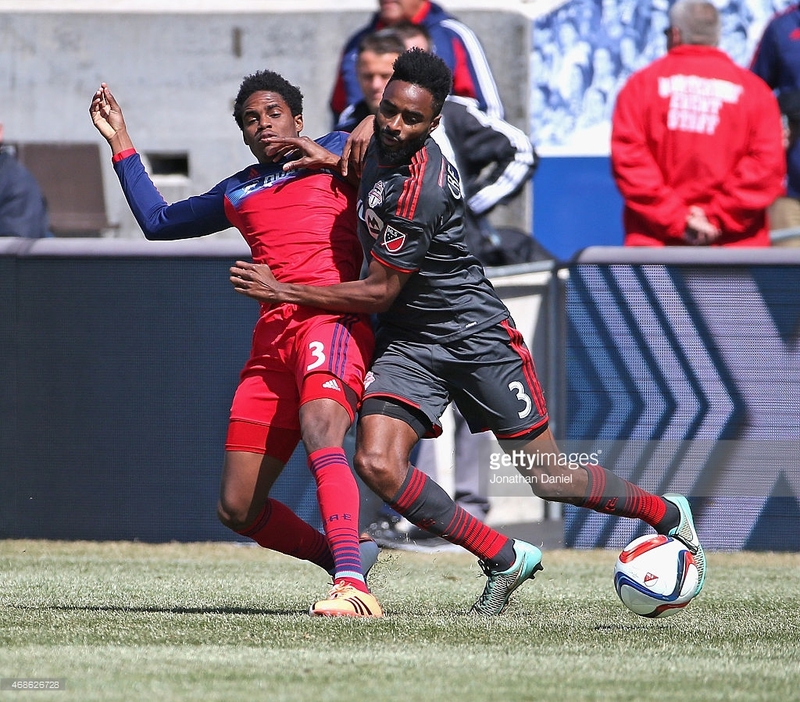 Nevertheless, the away side’s additional method of attack in the final quarter of the match was strictly direct. Lucas located Coutinho between the lines, and the Brazilian evaded a few challenges from deep to test Cech from distance – the Liverpool attacker also skipped past Bellerin to test the Arsenal keeper. Then a simple Mignolet punt resulted in Benteke winning an aerial duel and subsequently combining with Firmino to fire a wayward shot over the net. While Rodgers appeared content with the result in the final half hour, Wenger made attacking alterations to introduce pace in the final third. Walcott replaced Giroud upfront, whereas Coquelin was sacrificed for Alex Oxlade-Chamberlain, pushing Ramsey alongside Cazorla upfront. The risky change deprived Arsenal of a natural ball-winner, yet the introduction of Chamberlain would have benefited Giroud upfront. Liverpool’s deep defensive line prevented the Walcott from running behind the opposition’s back-line, but Oxlade-Chamberlain merited why he’s due for a starting role, particularly in home games. 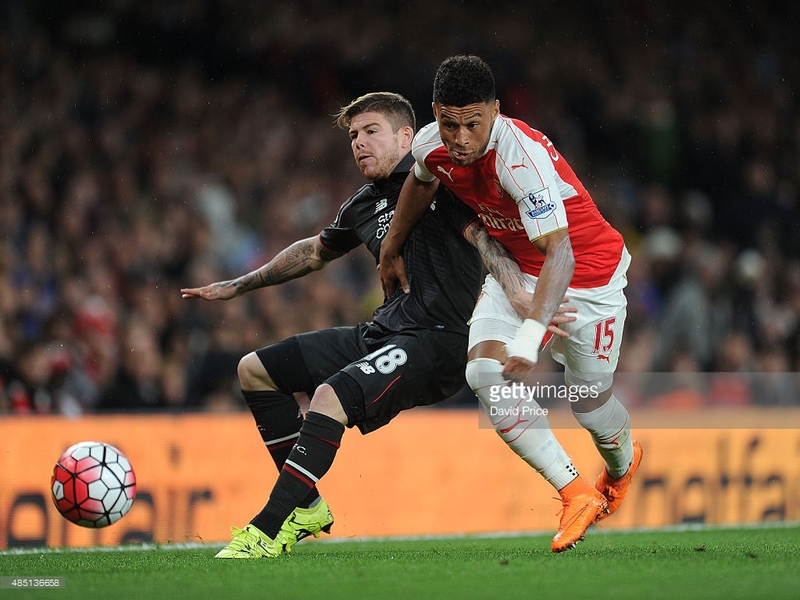 Alex Oxlade-Chamberlain of Arsenal is challenged by Alberto Moreno of Liverpool during the Barclays Premier League match between Arsenal and Liverpool on August 24, 2015 in London, United Kingdom. Ramsey’s driving runs from midfield did present a chance that nearly fooled Mignolet, but it was Oxlade-Chamberlain who forced the Belgian into several saves, foiling a weak area in Joe Gomez. 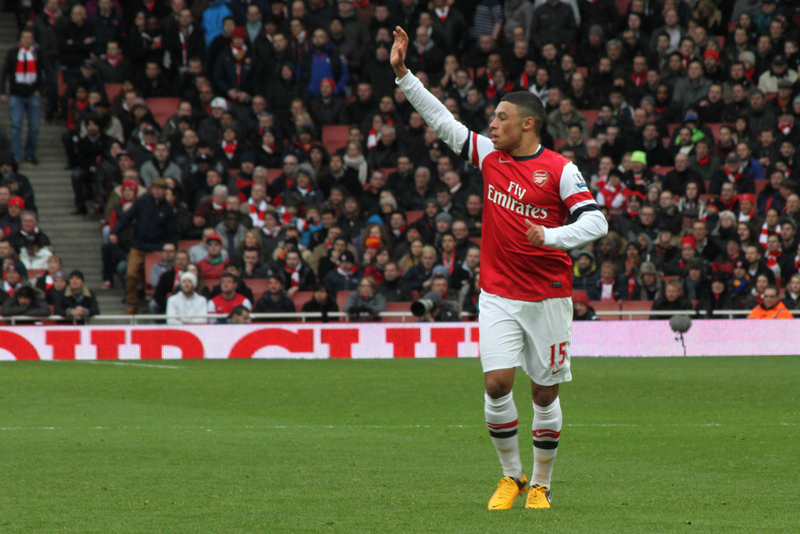 Perhaps a pairing of Ramsey and Cazorla left Arsenal susceptible to quick counters, but the Gunners lacked powerful deep runners throughout the match, and Chamberlain’s inclusion improved the balance in the final third and the likelihood of a winner. Most goal-less draws are quickly classified as dull encounters, but this fixture was fairly open and entertaining despite the poor finishing throughout. Liverpool will feel unlucky not to put the match out of sight in the first, yet Arsenal moved into better positions in the second, and should have executed. “Performance-wise I was very happy with how we worked. First half in particular we created chances and should have been in front. In the second half you always expect pressure,” said Rodgers. Rodgers displayed his tactical awareness and flexibility with the inclusion of Can and Lucas in midfield, thus leading to Liverpool’s best performance of the season. They pressed and harried superbly in central zones, maintained a narrow shape when required to do so, and constantly exploited Arsenal’s make-shift back four when they swiftly broke on the counter – inevitably all that was missing was the all-important goal to classify this as a remarkable away display. The same can’t be said for Wenger, as Arsenal’s entire set-up was peculiar. From the full-backs maintaining advanced positions, to not providing another holding midfield to help Coquelin protect the back four, the home side’s display was appalling. Oxlade-Chamberlain’s direct running from the right was beneficial, but this served as further evidence that Wenger must identify his preferred attacking quartet sooner rather than later. It appears Rodgers finally has a team that fits his stylistic preference – in regards to funds available – and his decision to move to a 4-3-3 highlights that while he can make mistakes, his side still remains tactically flexible. More so, this could be the Liverpool manager’s approach in big games until Daniel Sturridge returns to the XI. 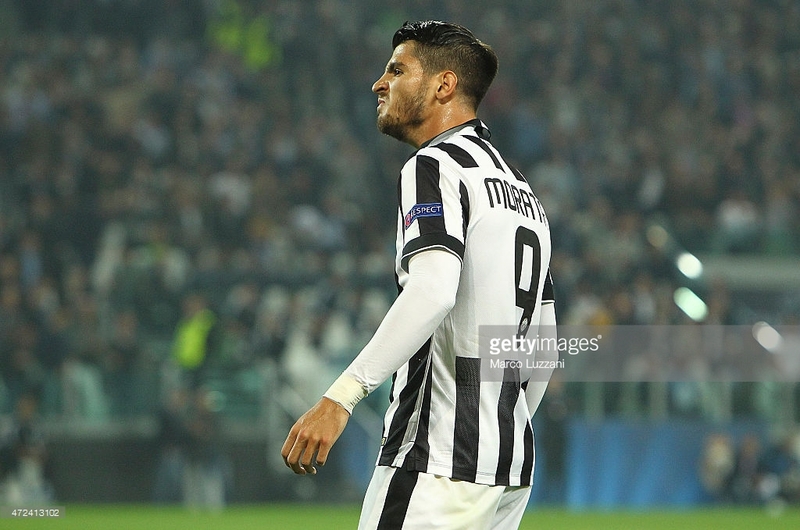 Alvaro Morata of Juventus celebrates after scoring during the UEFA Champions League semi final match between Real Madrid CF and Juventus at Estadio Santiago Bernabeu on May 13, 2015 in Madrid, Spain. Juventus progressed to their first European final in 12 years, earning a significant 1-1 draw against holders Real Madrid. Massimiliano Allegri made one change to his XI that defeated the Real Madrid last week in Turin, slotting Paul Pogba into midfield alongside Arturo Vidal, Claudio Marchisio and Andrea Pirlo. Carlo Ancelotti persisted with a 4-4-2, welcoming back Karim Benzema to his attack, and pushing Sergio Ramos to centre-back alongside Raphael Varane. In ways, this was very similar to the first leg: despite Real negating service into Juve’s strikers, the away side nicked an early second half goal, and remained organized and compact in deeper positions to close out the match. Sometimes it’s interesting to see how a personnel change can shift the pattern of an overall tie. Juve maintained an overload in central areas in the opening stages of the first leg due to Gareth Bale’s reluctance to press Pirlo – along with Vidal dropping deeper – thus providing Allegri’s side with an outlet into the strikers. 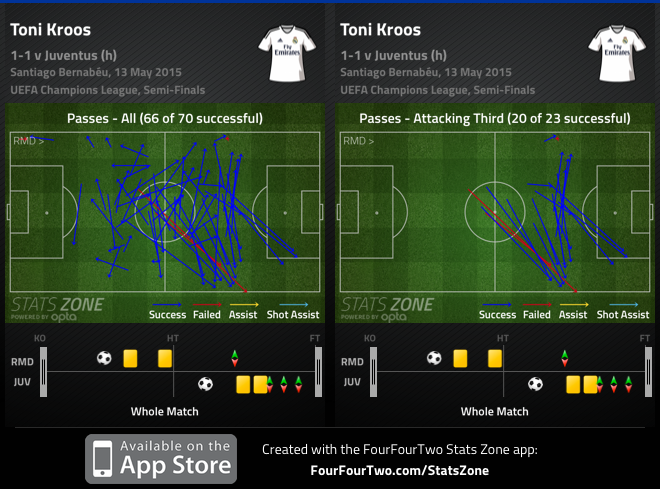 Benzema’s inclusion, however, ensured it was 4v4 in midfield. 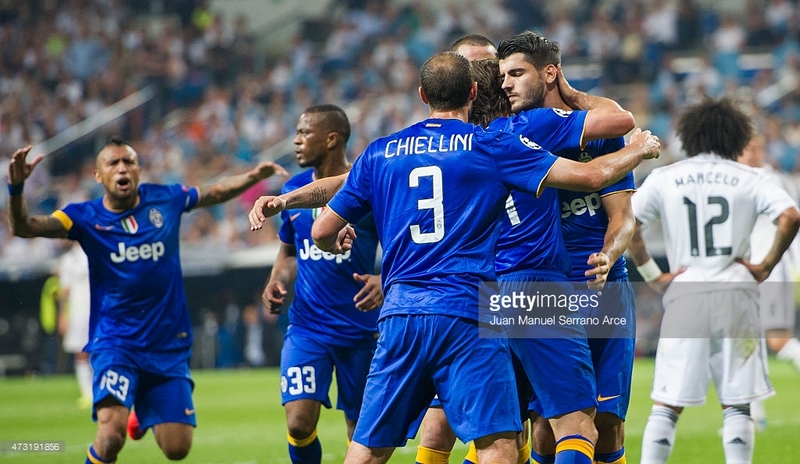 Juventus, though, encountered a few issues with their system. Even though Marchisio and Pogba pressed the Real full-backs when they received the ball, the Juventus midfielders couldn’t cope with Marcelo and Dani Carvajal’s adventurous running. Also, while Benzema stuck close to Pirlo, neither Carlos Tevez nor Alvaro Morata were interested in picking up Toni Kroos. Kroos was free to dictate the tempo of the match from deep positions, often playing a few exquisite diagonal balls behind Pogba for Carvajal. It’s not often that defensive players serve as the most significant factors in key European ties, but both full-backs were pivotal to Real’s goal threat. In the first leg it was Dani Carvajal’s clever ball into half space that allowed James to create Ronaldo’s goal, and here, Marcelo was equally important. Against sides that play in two narrow banks of four, with midfielders playing in wide roles – specifically Atletico – Ancelotti has relied on the width from his full-backs to stretch the game – it’s quite simple, but the quality in these areas coincide with Real’s efficiency. However, Marcelo’s threat was displayed in several ways throughout the match. In the first minute he stormed past Marchisio and clipped the ball to the far post, but Bale’s tame header flew over the net. Later on in the half, the Brazilian showcased his passing range – Marchisio also failed to close him down quickly – by clipping a ball into half space for Benzema, but Patrice Evra cleared his compatriot’s pull back to Ronaldo. For the most part, majority of Madrid’s attacks stemmed down the left flank, with Ronaldo occasionally drifting over to the touch-line to create space for himself to receive the ball, It was Marcelo’s pass into Ronaldo that led to the Portuguese forward charging towards the box, before James won the penalty that put Madrid ahead. Where Ancelotti may have introduced attacking full-backs later in the second half to torment a leggy back-line, both started at the Bernabeu as Madrid were required to score. Still, Marcelo didn’t tire and overloaded the left flank on two occasions – with James and Isco initially, then Ronaldo – but Bale skewed both chances inches wide of the net. Marcelo was undoubtedly Madrid’s best player — he was the catalyst behind Madrid’s best moves, and recorded the most take-ons and passes in the final third. It appeared that Allegri might have reverted to a 5-3-2 to preserve a slender first leg lead, but the Juventus manager persisted with four ball-playing midfielders, and simply instructing his defensive line to sit a few yards deeper. Following a shaky 10-minute spell, it was evident that the plan was to instantly get the ball into Morata and Tevez’s feet. Initially, Tevez aimed to scamper between the lines, while Morata played off the last shoulder, but the away side got into dangerous positions through the former breaking into Madrid’s half. Tevez dispossessed Kroos twice in the first half to break forward, storming into Madrid’s half to win a corner, while Vidal forced Iker Casillas to make a key save. Though Juve was calm in possession, and retained the ball confidently in short spells, apart from quick breaks through Tevez, the away side failed to create legitimate goal scoring opportunities from open play. Another interesting feat at the Bernabeu was the pattern change following Ronaldo’s opener. Both sides operated in a variation of a 4-4-2, and where Juve initially dropped into two banks of four, Real followed suit knowing Ronaldo’s penalty would secure progression. The issue with Allegri’s selection, however, was the lack of natural width. This meant Evra and Stephane Lichtsteiner surged forward to help stretch the pitch, thus leaving space in the channels for Madrid to break into. Similar to Juve, Ancelotti’s side easily ignited swift counters to move into dangerous positions, but this was purely based on the system tweak opposed to individual errors. First, James’ clearance into the left channel freed up Benzema to play a reverse ball into Ronaldo, but the recovering Lichtsteiner’s presence – despite being dropped to the floor – forced the Portuguese forward to deliver a cross, rather than shoot. Real exposed space behind Lichtsteiner minutes later through a simple Bale outlet pass, but this time the Swiss defender’s recovery run forced Ronaldo to rush his shot into the side netting. Pogba moved in-field to create space for Evra in the early stages, but the Juve were susceptible to counters when they pushed the full-backs forward. 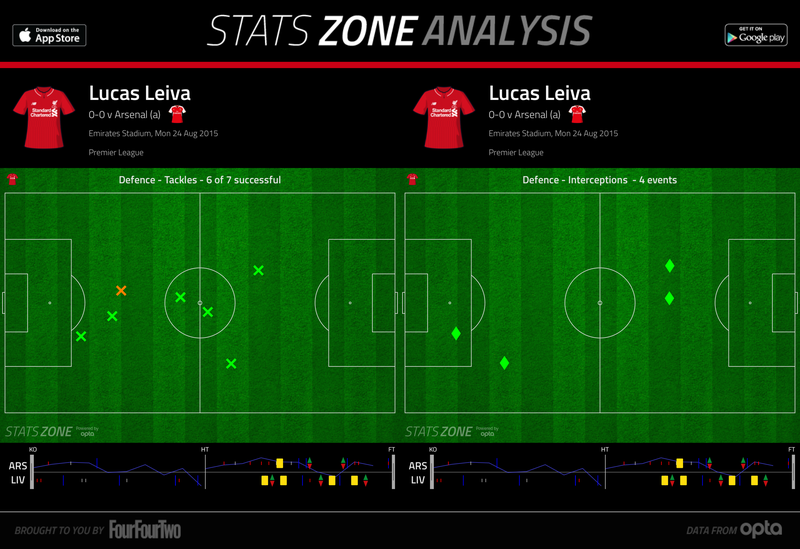 Both Lichtsteiner and Evra were cautious with their positioning in the second half. Sergio Ramos’ poor outing in Turin led to Ancelotti placing the Spaniard in his preferred position at the Bernabeu, which helped Real shut down Juve’s main threat. Real’s centre-backs proactively stepped forward to intercept passes and prevent the away side’s front pairing from turning towards goal. Although this effectively limited passes into the strikers, there were moments, when Morata in particular, held up the ball superbly and linked play with his teammates. Likewise, this forced Ramos and Varane into silly challenges away from Juve’s half, enabling the Italian club to push forward to alleviate constant waves of pressure. Coincidentally, it was Ramos’ clumsy challenge on Vidal that resulted in Morata scoring from the subsequent set-piece. Perhaps Ramos and Varane’s proactive defending stifled Juve’s main strength in the first leg, but it equally backfired on the European champions. 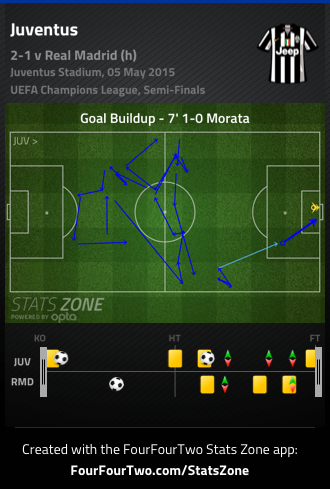 Morata’s equalizer prompted both managers to make identical moves from the first leg to alter the match. This time Javier Hernandez replaced Benzema, whereas Allegri reverted to a 5-3-2 with Andrea Barzagli moving into defence at Pirlo’s expense. The match followed a similar pattern at the Bernabeu with Madrid chasing a goal, and Juve sitting deep in their half to defend their lines. Ancelotti’s side reverted to hopeless crosses that were comfortably dealt with, and shots from distance that failed to test Gianluigi Buffon. 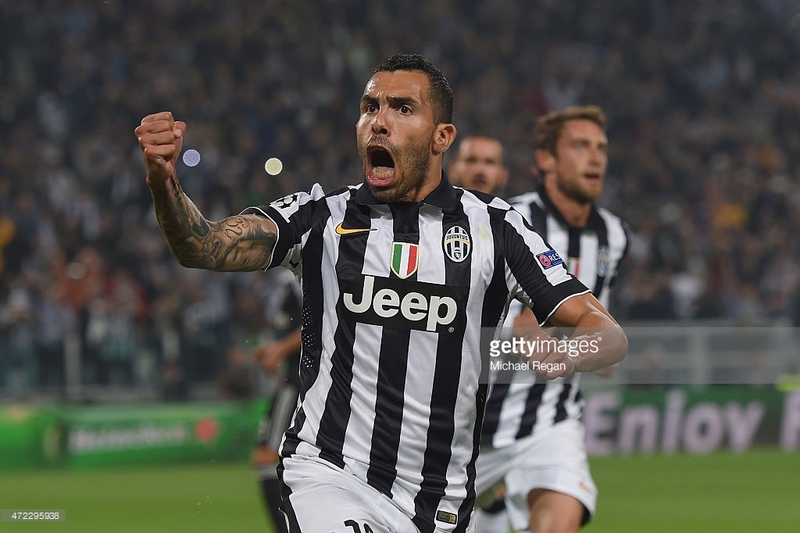 Juve, on the other hand, equally had their chances, with Vidal breaking lines on two occasions, yet Morata and Tevez were reluctant to set the Chilean free on goal. Another example of Morata’s hold up play was also on display when he rolled Varane to play a pass into Vidal, who instantly slid the ball to Marchisio in the box, but Casillas made a key save. Cristiano Ronaldo of Real Madrid CF duels for the ball with Arturo Vidal of Juventus during the UEFA Champions League semi final match between Real Madrid CF and Juventus at Estadio Santiago Bernabeu on May 13, 2015 in Madrid, Spain. Fernando Llorente and Roberto Pereyra were summoned in the latter stages, with the former also holding off Varane to create a chance for Pogba – further showcasing Allegri making better use of his bench than Ancelotti. Madrid lacked imagination for large portions of the second half, and despite the home side’s territorial dominance – and a few squandered Bale efforts – they never looked like scoring. 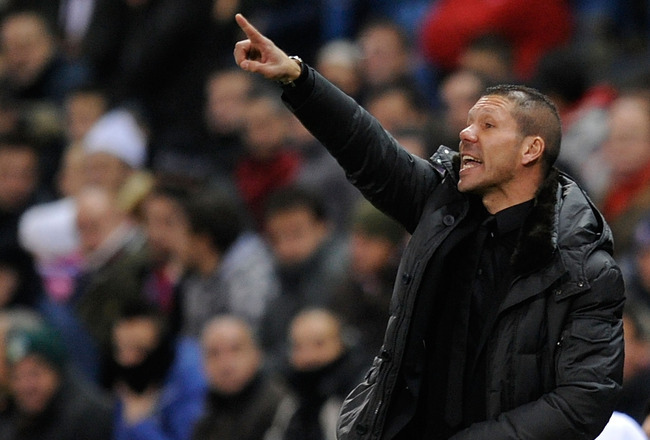 Stylistically, there were minimal changes to the tactical battle at the Bernabeu. Madrid continued to attack through their full backs, and attempted to thwart Juve’s threat through proactive defending from their centre-backs. Yet the pattern in both legs perfectly illustrated Real’s issue this season. They squandered several chances in the opening period, stagnated and conceded a goal midway through the match, and failed to provide Ronaldo with service (reverting to hopeless crosses into the box) in the latter stages. More importantly, Juve didn’t concede in open play, and deserve credit for defending superbly in two banks of four, while executing from a set-piece. Allegri comfortably out-coached Ancelotti over two legs, and will likely be forced to adopt similar tactics against Barcelona’s fluid South American attacking trio in Berlin.